At Setfive Consulting we’ve become big fans of using TypeScript on the frontend and have recently begun adopting it for backend nodejs projects as well. We’ve picked up a couple of tips while setting up these projects that we’re excited to share here! 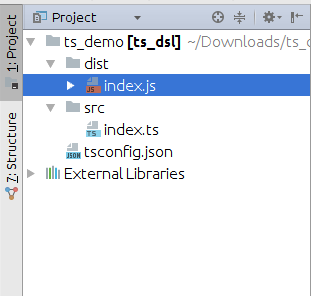 So with ts-node you’ll be able to run something like “ts-node src/index.ts” to run your code. And then you’ll be able to just invoke “nodemon” from the root of your project. src/index.ts(1,20): error TS7016: Could not find a declaration file for module ‘lodash’. ‘/home/ashish/Downloads/node_modules/lodash/lodash.js’ implicitly has an ‘any’ type. And now the compiler will run without any errors. At this point you should have a solid foundation for a TypeScript powered nodejs project. You’ll be able to take advantage of TypeScript’s powerful type system, nodejs’ enormous library ecosystem, and enjoy a easy to use “save and reload” workflow. And as always, I’d love any feedback or other tips! Thinking about adopting TypeScript at your organization? We’d love to chat. So what are a couple of these features? We’ll be looking at code from Setfive’s CloudWatch Autowatch an AWS cloud monitoring tool written in TypeScript. Since TypeScript is evolving so quickly it’s worth noting that these examples were run on version 2.4.2. Anyway, enough talk lets code! partyguests.ts(5,9): error TS2322: Type ‘null’ is not assignable to type ‘string’. Since the compiler can infer that at least one code path in the function produces a null which is now incompatible with an array. An example of this in the Autowatch code are the checks to ensure that PutMetricAlarmInput instances aren’t created with null dimensions. At line 462 for example. match2.ts(19,24): error TS2345: Argument of type ‘BulkMessage’ is not assignable to parameter of type ‘never’. It’s certainly not as elegant as the Scala example but it does the job. You can see a real example in Autowatch starting at line 168 where we used it to guarantee exhaustive matching on the available AWS services. Marking a class property “readonly” signals to the compiler that code shouldn’t be able to modify the value after initialization. Although “readonly” may sound similar to marking a property as “private” it actually enhances the type system in important ways. First, “readonly” properties make it possible to more faithfully represent immutable data. For example, a HTTP Request has a “url” which will never change after the request has started. And by marking properties as “readonly” as opposed to private you’re still able to return literal objects with matching properties. readonly.ts(6,5): error TS2540: Cannot assign to ‘url’ because it is a constant or a read-only property. But if you switch it back to “readonly” it’ll work as expected. You can see real world usage of this in Autowatch, where we marked properties in our Config class as readonly since they should never change once the object has been constructed. Well that’s three pretty cool features of the TypeScript type system that should help you be more productive and write better code. If you found these interesting, there’s several other interesting type related features that landed in 2.3+ versions of TypeScript that are worth checking out. Despite how important they are, MySQL indexes are a bit of a dark art. Sure everyone knows indexes are important but details on how they’re implemented and when they’ll be used are hard to come by. Beyond regular indexes, MySQL’s composite indexes are especially opaque in regards to how and when they’ll be used. As the name suggests composite indexes are an index constructed across two columns versus a regular index on a single column. So when might a composite index come in handy? Let’s take a look! And we’ll fill it up with 5 million fictional orders with dates spanning the last 10 years. You can grab the data from https://setfive-misc.s3.amazonaws.com/client_order.sql.gz if you want to follow along locally. ~1.5 seconds to calculate the sums and according to the EXPLAIN MySQL had to use a temporary table and a filesort. Will an index help here? Lets add one and find out. ~0.2 seconds and looking at the EXPLAIN we’ve cut down the number of rows MySQL has to look at to 424, much better. OK great, but now what if we’re only interested in looking at data from Christmas Eve in 2016? And there you go! MySQL only has to look at 1360 rows as expected. Anyway, as always comments and feedback welcome! I was recently out with a friend of mine who mentioned that he was having a tough time scraping some data off a website. After a few drinks we arrived at a barter, if I could scrape the data he’d buy me some single malt scotch which seemed like a great deal for me. I assumed I’d make a couple of HTTP requests, parse some HTML, grab the data and dump it into a CSV. In the worst case I imagined having to write some custom code to login to a web app and maybe sticky some cookies. And then I got started. Whitelisted User Agents – Following a few requests from PHP cURL the site started blocking requests from my IP that didn’t include a “regular” user agent. Soft IP rate limits – After a couple of dozen requests from my IP I started receiving “Solve this captcha” pages in order to view the target content. With a full browser environment, we now need to tackle the IP restrictions that cause captchas to appear. At face value, like most people, I assumed solving captchas with OCR magic would be easier than getting new IPs after a couple of requests but it turns out that’s not true. There weren’t any usable “captcha solvers” on npm so I decided to pursue the IP angle. The idea would be to grab a new IP address after a few requests to avoid having to solve a captcha which would require human intervention. Following some research, I found out that it’s possible to use Tor as a SOCKS proxy from a third party application. So concretely, we can launch a Tor circuit and then push our Electron HTTP requests through Tor to get a different IP address that your normal Internet connection. Ok, enough talk, show me some code! Once it loads, you’ll see the test page in what looks like a Chrome window with a devtools instance. As it refreshes, you’ll notice that the IP address is displays for you keeps updating. One “gotcha” is that by default Tor will only get a new IP address each time it opens a conduit, so you’ll notice that I run “killall” after each request which closes the Tor conduit and forces it to reopen. And that’s about it. Using Tor with the skeleton you should be able to build a scraper that presents a new IP frequently, scrapes data, and conveniently notifies you if human input is required. As always questions and comments are welcomed! A feature request we get fairly frequently is the ability to convert an HTML document to a PDF. Maybe it’s a report of some sort or a group of charts but the goal is the same – faithfully replicate a HTML document as a PDF. If you try Google, you’ll get a bunch of options from the open source wkhtmltopdf to the commercial (and pricey) Prince PDF. We’ve tried those two as well as a couple of others and never been thrilled with the results. Simple documents with limited CSS styles work fine but as the documents get more complicated the solutions fail, often miserably. One conversion method that has consistently generated accurate results has been using Chrome’s “Print to PDF” functionality. One of the reasons for this is that Chrome uses its rendering engine, Blink, to create the PDF files. So then the question is how can we run Chrome in a way to facilitate programmatically creating PDFs? Enter, Electron. Electron is a framework for building cross platform GUI applications and it provides this by basically being a programmable minimal Chrome browser running nodejs. With Electron, you’ll have access to Chrome’s rendering engine as well as the ability to use nodejs packages. Since Electron can leverage nodejs modules, we’ll use Gearman to facilitate communicating between our Electron app and clients that need HTML converted to PDFs. As you can see it’s pretty straightforward. And you can start the Electron app by running “./node_modules/electron/dist/electron .” after running “npm install”. After that, you can launch your Electron app normally and it’ll use a virtual display. Anyway, as always let me know if you have any questions or feedback!